FILE - A U.S. Army soldier gestures to a fellow solider as they participate in annual military drills in Yeoncheon, South Korea, near the border with North Korea, April 11, 2013. The United States and South Korea began an annual joint military exercise Monday, despite angry threats from North Korea. As many as 80,000 U.S. and South Korean forces are taking part in the computer-generated Ulchi Freedom exercise, which simulates a response to a military invasion by the North. The exercise is taking place amid heightened tensions on the peninsula after two South Korean soldiers were maimed when landmines exploded as they were patrolling the demilitarized zone separating the two rivals. Seoul blamed Pyongyang for planting the mines, and resumed propaganda broadcasts via loudspeakers near the countries' tense border Sunday for the first time in in more than a decade. South Korea's broadcasts began after two of its soldiers were maimed when landmines exploded as they were patrolling the demilitarized zone separating the rivals. Seoul has blamed the North for planting the landmines, a charge Pyongyang has strongly rejected. North Korea has promised to take the "strongest military counteraction" in response to the joint U.S.- South Korea exercises. As many as 80,000 U.S. and South Korean forces are taking part in the exercises. 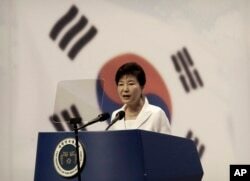 South Korean President Park Geun-hye on Monday called for a strong military readiness on the Korean Peninsula. "However, North Korea distorts and condemns the essence of the Ulchi exercise every year, continuing military threats," said Park. "As far as the North's hostile attitude and provocative threats continue, we need to be prepared with a strong deterrent to counter the North, and the Ulchi exercise is a great opportunity to check and examine our preparatory position for securing our citizens' safety and the national security," she said. South Korean broadcasts were aimed at emphasizing that the mine blast was provocation committed by North Korea and relaying messages about the superiority of Seoul-style democracy as well as world news and weather forecasts, the South Korean Defense Ministry official said. South Korean protesters shout slogans during a rally demanding to stop the joint military exercises, Ulchi Freedom Guardian or UFG, between the U.S. and South Korea near the U.S. Embassy in Seoul, South Korea, Aug. 17, 2015. The North has rejected South Korea's accusations. It said the broadcasts and the exercise both amount to a declaration of war, and has promised to take the "strongest military counteraction" in response. FILE - South Korean President Park Geun-hye delivers a speech during a ceremony to celebrate Korean Liberation Day from Japanese colonial rule in 1945, at Seong Cultural Center in Seoul, South Korea, Aug. 15, 2015. "As far as the North's hostile attitude and provocative threats continue, we need to be prepared with a strong deterrent to counter the North, and the Ulchi exercise is a great opportunity to check and examine our preparatory position for securing our citizens' safety and the national security,” she said. Seoul and Washington have described the joint military exercises as purely defensive in nature.